Our founding Director – David Hancock visited the Oman Botanic Gardens recently on a research trip with Dermot Molloy from the Royal Melbourne Botanic Gardens. The purpose of the trip was to assist the team there with propagation issues, investigate restoration issues and to promote the IPPS and SERA. Oman have an extraordinary vision for their botanic gardens and it will truly be an oasis in the desert. The focus for now has been the propagation of plants from seed and cuttings. Over the past 10 years, the team there have catalogued the flora of the region and have been collecting material and salvaging plants where possible. They have over 300,000 plants in production with a substantial seed bank and herbarium being established. Their mission is to be the biggest botanic gardens in the region providing a world class centre for plant research, learning and conservation. The gardens will display beautiful Wadis, replicate fog forests of Dhofar, the baking sand desert, unique Juniper forests and the salty Sabka. 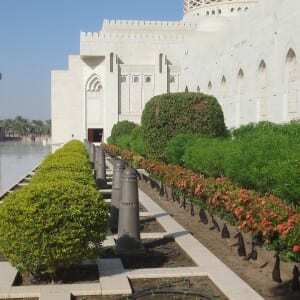 With visitors being able to explore two giant biome enclosures, recreating unique climates, ride on land trains and discover age-old Omani traditions and skills, buy plants and enjoy fine foods. The challenges faced by the team include a general lack of horticulture in the country, inexperience, searing heat for three quarters of the year, low rainfall and little community appreciation of biodiversity values and environmental impacts. David is back there this year to consult with them on their seed collection and germination procedures.